As we discuss In Dubious Battle we’ll necessarily come up against the notion (the aesthetic ideology) of Realism. The diegesis of Steinbeck’s novel is one that we can immediately recognize as ‘real’ in terms of its characters and locales. IDB represents the world in a way that seems to be transparent and intelligible, an “obvious” “reflection” of reality as we know it. This response on our part, of course, is the product of lifelong conditioning which encourages us to confuse causes and their effects. What do these markings on paper have to do with the world we think we know? To what extent is our sense of the novel’s “truth”, its veracity, a product of prior knowledge of the Great Depression? Those are deeper questions that bear some scrutiny and we will have to confront them in some form as we attempt to master the novel’s content. In other words, our conversations about this work will address both the “what-said” and the “how-said”– those two dimensions of signification that are impossible to separate. Realism presents itself as an uncomplicated and straightforward method of description, a series of pictures of a familiar world– not unlike photographs. As such it effaces its own textuality, the linguistic materials that go into Steinbeck’s production of an orchard workers’ strike in California. Perhaps it’s easiest to grasp this double gesture of revelation and concealment if we think about documentary film as a model. The documentary film seems to show us the world without mediation, as directly accessible to our experience. Yet the apparatus of film-making, in terms of both physical tools and discursive methods, intercedes between the text and the audience. The camera, sound equipment, editing, framing, etc.– all of the artistry and artifice of making a movie go into the representation of a subject that to the unsophisticated viewer seems merely, naturally given. Realism of the sort practiced by Steinbeck in In Dubious Battle might also go by the name of Naturalism. The difference between these two genres is somewhat narrow: Naturalism tends to treat life in its grittier aspects; its characters are generally working class or underclass; human existence is often portrayed as overdetermined by social and natural forces which are ultimately beyond any control. So, for instance, another great novel of California, McTeague, written by Frank Norris at the turn into the 20th century, takes as its subject the bestial Mac, an uncredentialed, sadistic dentist whose inner tendencies toward cruelty and brutishness are inexorably fulfilled. Norris’s novel suggests the fundamental inalterabilty of human nature, a situation in which destiny is enmeshed in biology, one where the social environment degrades those consigned to it and every existential trajectory is charted in advance. 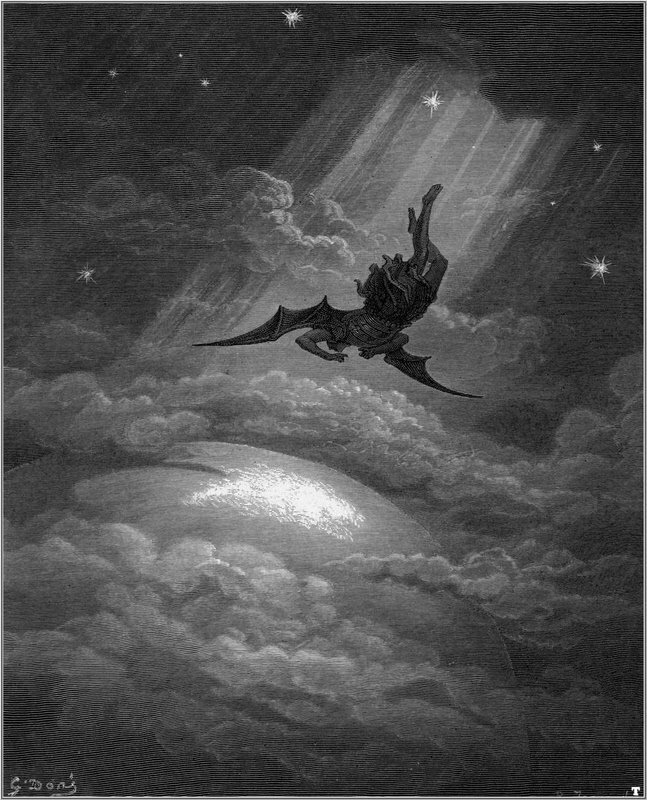 Satan, as a literary character, has long been portrayed as a symbol of insurgency, and Paradise Lost was in a sense as much about the right of English subjects to depose the King during the Revolution of 1644 as it was an effort to write a Christian myth in the Greek epic manner. Here, then, is a contradiction: the revolt against the master is viewed with sympathy, but the facts of that uprising– its execution, its inversion of a divine order– risked terrifying consequences. This entry was posted in California Culture and tagged California, Great Depression, Modernity, Radicalism on March 31, 2008 by apciv. I read an essay once that called Steinbeck an ‘apple pie radical’. Cute. But maybe he seems insuficiently proletarian because John’s working a populist-agrarian trope: dispossession from the land resonates at a heavy symbolic level– the first humans cast out, the Hebrew tribes in exodus from pharaoh, etc. Finally, here are some notes for a lecture on the Depression I once gave at Scotts Valley High. It’s by no means exhaustive, but it might be helpful in locating IDB in its cultural/historical context. The American Dream is as old as America, which is to say the United States, which, in the scheme of things, hasn’t been around that long. We might push back in time to the period prior to the United States when North America was a system of colonies under the French, British, Dutch, and Spanish to find the seed of this dream, its undeveloped beginnings. Going back to the opening of the western hemisphere to European colonialism means the 15th century– still not very long ago in terms of the span of human culture (which, some say, is about 100,000 years old). This period– the late 15th and early 16th centuries– is potentially important for our purposes because it witnessed two crucial events: the birth of a new economic system– capitalism— and, with it, the beginnings of modernity. That’s too big a task for today. Nor is there time to discuss a significant change within capitalism that is connected to the American Dream that occured roughly 200 years after the western hemisphere was colonized and has been called “the rise of the bourgeoisie.” We must set aside those questions for now, because our focus is fairly specific: the American Dream and its relationship to the Great Depression. 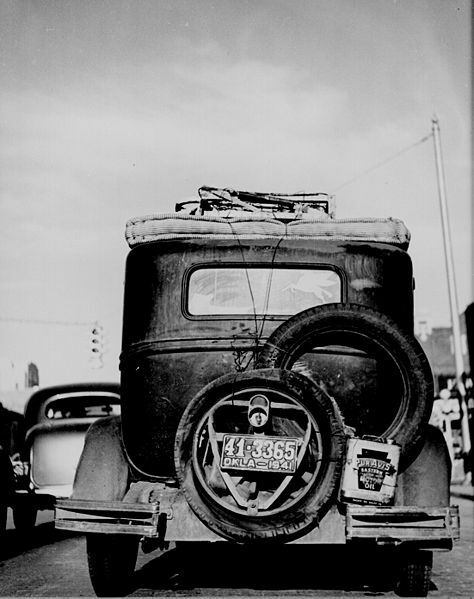 This entry was posted in California Culture and tagged California, Great Depression, Modernity, Nostalgia on March 27, 2008 by apciv. The article goes as far back as Belgian colonization (1885)– when King Leopold claimed the area as his personal possesion– and covers the vicissitudes of national independence and Western neo-colonialism. Of particular note is the reference to coltan, a very valuable mineral used in the production of cellphones. During the conflict in DRC various armed groups funded themselves by selling coltan and the money those sales generated went to the purchase of arms. It goes without saying that this telecommunications version of “blood diamonds” ended up in the United States. Your cellphone may contain some. So much for “free” minutes. The point here, at least in terms of HUM 415, is the nature of globalization: we have become increasingly bound up with one another even if we dismiss that fact as irrelevant. Yet there seems to be a paradox here: even as economic relations grow more complex and entangled, consumer technologies available in the First World work to seal us off from one another or limit our contact to a narrow range of acquaintances. If we’re intellectually curious enough, we know significant events are transpiring around the globe– we can witness them at one remove via internet, etc. At the same time ipods, cellphones and pc’s constitute a social landscape that is either purely individuated or stripped down to a micro-community. Even the nominal collectivity of the latter is strange as it is more often than not mediated through electronics. So, a contradiction: widening fragmentation in the midst of deepening imbrication. This entry was posted in Africa, Contemporary Culture and tagged Africa, Empire, Globalization, Politics, Post-colonialism on March 27, 2008 by apciv. This entry was posted in General on March 26, 2008 by apciv.